This is about a recently renovated residence that dates back to 1768. It consists of two bedrooms, living room, kitchen, bathroom. It can accommodate up to 5 people. It is surrounded by yards and garden. Air conditioning, TV and internet access are available. In the kitchen there are all necessary utensils. The property is secured by gates and there is private parking. 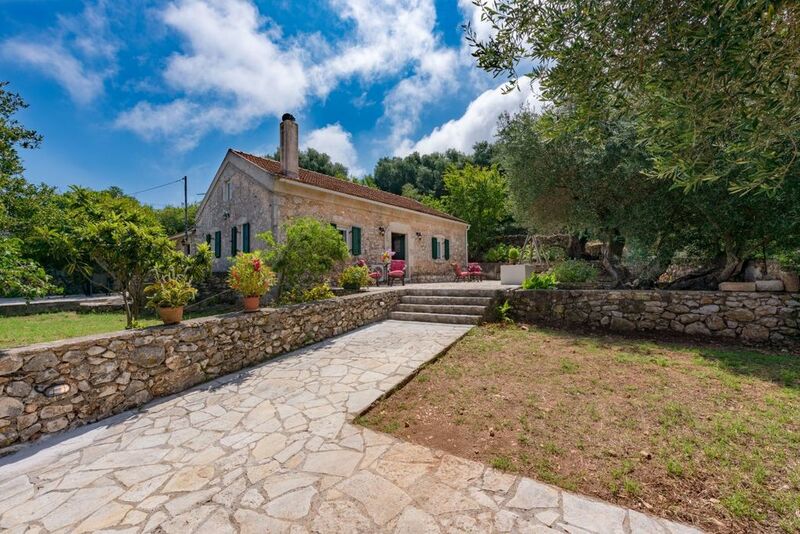 It is located in Markantokata, 500m from Antipata, 3 km from picturesque Fiskardo and the beaches around. The feeling that this house exudes is unique as it has been restored with respect to the tradition of ages. In the garden the visitors can still see the old "lino" and the "podohi" that have been preserved, where the grapes used to become wine. Inside the kitchen there is also the old stone-built oven. The house is comfortable and its location is ideal for a quiet family holiday that one can admire the lush green vegetation of the place and the feeling of a picturesque village. In just 5 minutes, however, one can be found in the lively and nightlife of the cosmopolitan Fiscardo. This residence is surrounded by a garden and two courtyards. In the garden there are ancient olive trees and more trees that offer their rich shade. One courtyard is located outside the kitchen, where guests can enjoy their meal or dinner under the thick shade of a century-old fig tree. The other courtyard is located at the main entrance of the house where guests can relax in the bamboo lounge or stone-built traditional bench. Guests may contact me and I will be available for any kind of help, information or advice they need either about the house or about their stay and holiday in general. Markantonata village is just 3 km from the picturesque and cosmopolitan Fiskardo, where the visitor has plenty of choices for restaurants, cafes, taverns, gift shops and super markets. At 500 meters, in the village of Antipata, there is a grocery store, restaurants and cafés as well as a gift shop. I have been always enjoyed taking care of my family and friends and I find it really interesting acquainting more people from all over the world. Willing to help and host as Greek hospitality defines. This property was a family inheritance at the village I was born and spent my childhood. A place where I will always return! It was renovated by my parents and my husband and I now decided to dispose it as a touristic accommodation. The traditional architecture will capture you and take you 250 years back. In the garden the visitors can still see the old "lino" and the "podohi" that have been preserved, where the grapes used to become wine, as well as the old stonebuilt oven in the kitchen. In the kitchen there is a table and chairs for 4 but there are more chairs if needed.